Wake up! – Money does not buy Humanity | I think, therefore I exist. In the 21st century, with progress and the wonders of new technology, our reality is sad. The propaganda shows us that life is better than it has ever had been, that life is easy, people are happy, food is tasty, everything is fun and nobody is alone because connecting with people is so easy. We have been fooled for what do we have? 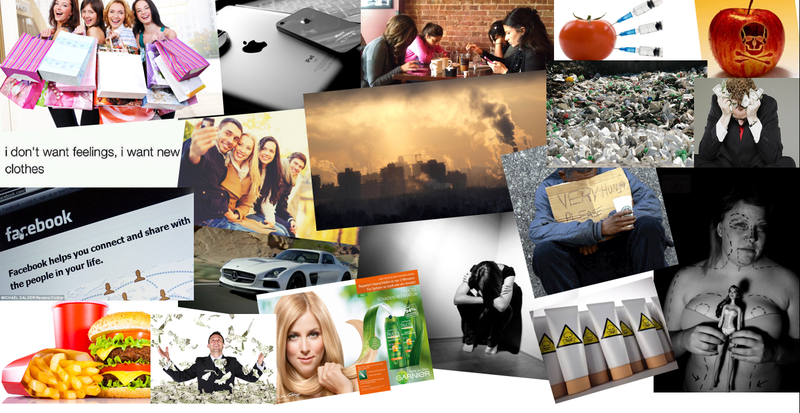 Depression, isolation, pollution, misery, insecurity, transformed food and toxins all around us. There is no advantage in the way we live nowadays, our window of understanding was simply set here. We have been convinced that money is the way to happiness and the most important things were left behind: health, self-love and respect, family, friends, loved ones. Instead, we pursue things that are destructive to us. We search for stuff that will make us love ourselves when those things only make us believe we always need something more to be worthy: make up, cosmetics, clothes. We look for ways to connect with people, but those are the mechanisms that push us further apart. We try to fill our empty hearts with things that only deepen the emptiness that there is inside us. We try to connect with people in ways that only increase the isolation. Day by day we are either more depressed or more asleep. We are piling up things but these things don’t give us anything anymore. We act more like machines than like human beings. We are literally poisoning ourselves with the transformed food we eat and the cosmetics filled with toxins we use, not to speak of even more self-destructive things like smoking. We are doing even more damage to the environment, trashing it, destroying it with no mercy or respect. This goes beyond self-destruction, this is suicidal. And what for? The answer is almost laughable: for money. We live in a inhuman world of ambition and switched priorities. And although the great majority of people do not have bad intentions, almost everyone condones with this system, and contributes to the sharpening of the destruction of everything that is good. Everyday, people make choices: to buy things that were made by exploitation or cruelty, to support immoral companies, to produce more waste than our planet can possibly tolerate, to hide behind a screen that separates one from everyone else. Mostly, these actions don’t even seem like choices because we are too distracted to think about these things that we do machine-likely. Of course none of this happened by chance. It is no coincidence that constantly we are bombed by entertainment, means to evade ourselves from what is happening around us, and specially powerful means of alienation. How else could people be convinced to consciously support a system above health, happiness and Humanity, destroying the planet they live in, harming their health and their home? A proactive and conscious society is an inconvenient. For this matter, it is best a society that is asleep by entertainment that numbs the soul and the reasoning. This is a society that massively buys transgenic food, products with cancerisn and neurotoxic toxins and supports injustice, misery and a system that is first and foremost in decay. This system is in decay because its own principles are self-destructive. If we continue destroying the world like this, one day it will be unbearable and we will all die. Literally. Nature is eternal and will flourish long after our species is gone forever. It is ourselves that we are destroying. We cannot win Nature, we must respect her and live in harmony with her. Furthermore, I don’t think people will allow themselves to be stepped on forever. Everyday there are more people fighting for a better future. One day, people will act like people. And being human is such a blessing, such a miracle. We are capable of the most beautiful things, the utmost kindness and goodness. The world does not need more money, the world needs more Humanity. « People = Numbers ? 🙂 I have been thinking for a while about doing a post about human blessings , I just haven’t thought enough about it to write it yet, but it is a idea I would like to pursue.